What is there to say about a movie that knows exactly what it is and executes itself in competent fashion? Turns out, not too much really-especially when one is talking specifically about something as frivolous as Office Christmas Party. After watching this hour and forty-five minute comedy my friend and co-host at Initial Reaction summed up what we'd just experienced perfectly. Describing the "here for a good time" flick that actually ends up overstaying its welcome as a raunchier version of one of those holiday themed, multi-plotted, department store advertisements as directed by the late Garry Marshall, Office Christmas Party piles on the recognizable names and faces (Hey! There's Jennifer Aniston again! ), juggles a handful of plotlines, and ultimately comes off as trying too hard to have some kind of genuine heart when we all know the only reason it actually exists is to cash in on certain weekends of the year when viewers seek reminders for how they should/would like to feel around the holidays. This wouldn't be so bad considering Office Christmas Party has a more than capable cast and isn't nearly as hokey as those aforementioned Marshall pictures, but the film ultimately tries to do too much with very little when it would have been fine had it simply allowed its talented comedic ensemble to feed off one another. While Marshall's films more or less turned a holiday of its choosing into a combination of Crash and any Hallmark movie ever Office Christmas Party at least has a driving plot that keeps the focus on only the characters involved in the central narrative and has each of them chasing and contributing to the same goal. There are no extraneous stories that have to strain to connect all the random characters together, but that doesn't mean every subplot should have been kept either. It is in its inability to restrain from both following one too many superfluous factors as well as devolving into something it clearly had no intention of being until it realized the credits had to roll at some point that Office Christmas Party suffers, but when it is having fun, making jokes, and letting the comedic talent it has enlisted to roam freely it's a consistently hilarious time that delivers on what its promotional campaign promised. 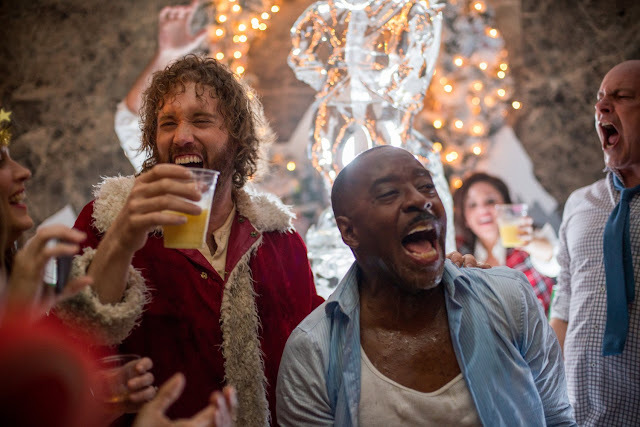 Clay Vanstone (T.J. Miller) shows Walter Davis (Courtney B. Vance) the time of his life. Photo by Photo Credit: Glen Wilson - © 2016 PARAMOUNT PICTURES.Â ALL RIGHTS RESERVED. Strangely enough, Office Christmas Party has a little too much plot for its own good. The set-up of Clay (T.J. Miller), the clueless but good-hearted son of the founder of a profitable tech company who now manages his father's favorite branch in Chicago, is set to throw the annual Christmas party in a fashion his old man would have appreciated. That is, of course, until his sister Carol (Aniston), who is serving as the interim CEO in light of their father's recent passing, comes in and threatens to shut the branch down due to their poor performance over the last quarter. Josh (Jason Bateman) is Clay's best friend and more or less the guy who is actually running the branch of Zenotech in which they both work. Given Carol is threatening to shut down the branch it seems a given the Christmas party is also canceled as it is deemed an unnecessary expense. Clay and Josh, being desperate to save the company by any means possible are only given one option by Carol and that is to convince Walter Davis (Courtney B. Vance) to choose Zenotech as the vendor for his company's $14 million server deal. This is a long shot to say the least as Zenotech has been in something of a holding pattern on developing any new technology over the past few years, but Tracey (Olivia Munn) who is the head of development and may or may not have a thing for the newly-divorced Josh has a few ideas that could save the company if they can in fact get Mr. Davis to listen to them. This is where Clay hatches the plan to show Davis the time of his life by going the complete opposite of his sister's instruction and throwing the biggest office Christmas party ever hence the title. Simple, right? Had directors Josh Gordon and Will Speck (Blades of Glory) simply allowed the film to ride out this objective while filling the remainder of the running time with little asides about those who work within the office as it admittedly does to some effect things would have been fine and about fifteen minutes shorter. Rather, the movie abandons the titular party with half an hour left and goes off the rails to the point it has to swing so far back around to get to a logical stopping place it can't help but feel overly long and overly convoluted. 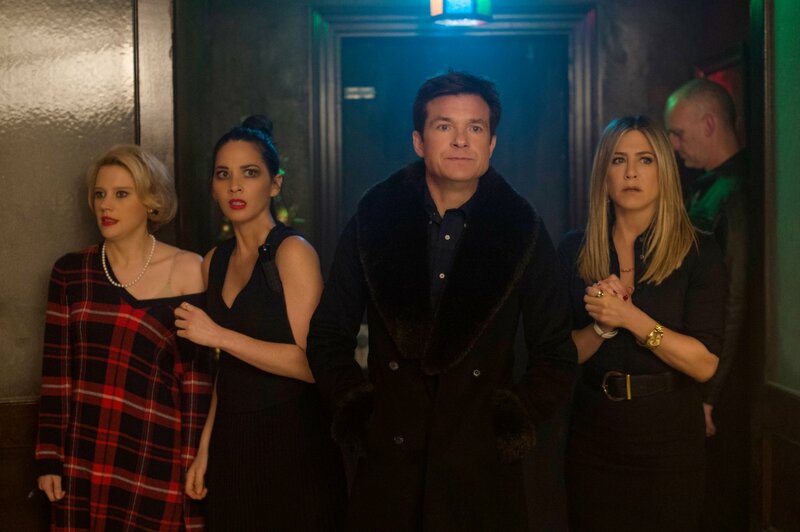 From left: Kate McKinnon, Olivia Munn, Jason Bateman, and Jennifer Aniston in Office Christmas Party. Furthermore, the likes of Vanessa Bayer, Randall Park, Rob Corddry, Sam Richardson, Karan Soni, and Jillian Bell are each fun to watch as they fill in the caveats of story around and within the party. Bayer and Park lather on the awkward as a single mother and the new guy in the office who somewhat feel pushed together by the conventions of their lives and roles at work; the fruits of which come crashing down when Park's fetish-driven Fred can't hold back his sexual fantasies. Corddry does his shtick where he gets short-fused and yells mean things at suspecting victims, but he gets a nice payoff through that of McKinnon's character and the "opposites attract" relationship they share with one another. Soni's nerdy Nate can't stop going on about his supermodel girlfriend so as to assure everyone in the office that he does in fact have a girlfriend, but when it comes time to bring reality to all the hype he's been building Nate has to rely on an egomaniac of a pimp in Bell's likely schizophrenic Trina to get him through. Bell, like McKinnon, could likely say anything in her own particular way and some humor could be derived from it. While Bell is mostly short-changed in terms of screen time here I can only hope she'll soon get a vehicle for her talents much the same way Office Christmas Party proves a worthy machine for Miller's raucous persona. Bringing a dose of weight to the proceedings is that of Vance (The People v. O.J. Simpson: American Crime Story) who, while little more than a humorless plot device, is able to make the events that become the main subject of the movie worth the investment of time it ultimately requires. Should Office Christmas Party have been slimmer and less plot heavy? Absolutely. Is there anything that detracts from the titular party in such a fashion as to be completely devastating to the overall quality of the comedy? No, not really. Office Christmas Party, the end result, is very much in line with what one would likely suspect they're getting themselves into if purchasing a ticket. If one is indeed purchasing a ticket for an R-rated, holiday-themed comedy than they will likely be happy with that purchase as Office Christmas Party features a bunch of really funny people playing off one another to hilarious effect consistently enough that the laughter rarely dies down despite the plot doing its best to distract from the laughter.